The Gravity Flow WooCommerce Extension version 1.1 is now available via auto-update and for download from the account page. This is a major feature release that adds a new Checkout step, support for the Gravity Forms Product Add-Ons Extension and support for triggering workflows for selected order statuses. It also contains an important bug fix so we recommend that customers upgrade as soon as possible. View the release notes for version 1.0 of the WooCommerce extension. Create Entries on Specific Order statuses. 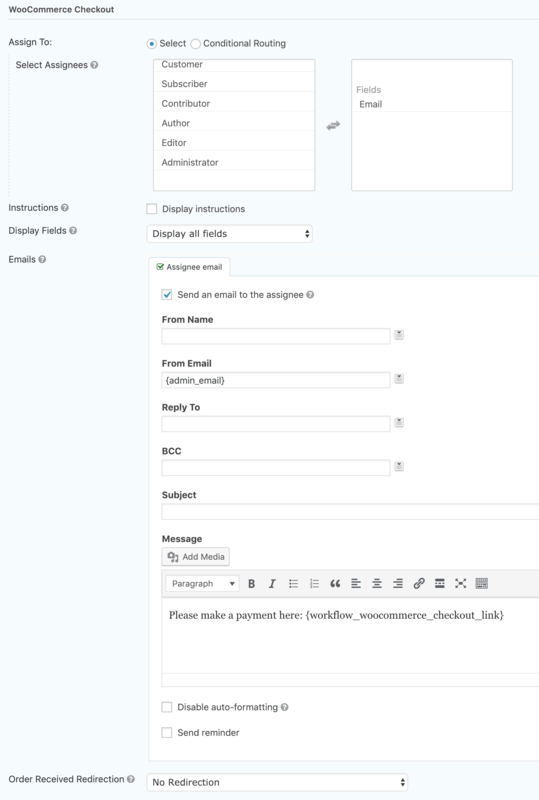 Previously, in version 1.0, workflows had to start at the WooCommerce checkout. In version 1.1, the new Checkout Step can be used at any point in the workflow to take a payment for a product in WooCommerce. Once the order has been created the customer can then be redirected to a page, for example, their workflow inbox with their pending workflows. Admins can now change the status of an order from the workflow detail page while the entry is on a Payment step. The Gravity Forms WooCommerce Add-On in some situations may create multiple entries per order. In version 1.1, all the entries waiting on a payment step will be now be released at the same time when the payment is complete. View the documentation for the WooCommerce Extension. Added a new form setting “Create Entries on Specific Statuses”. 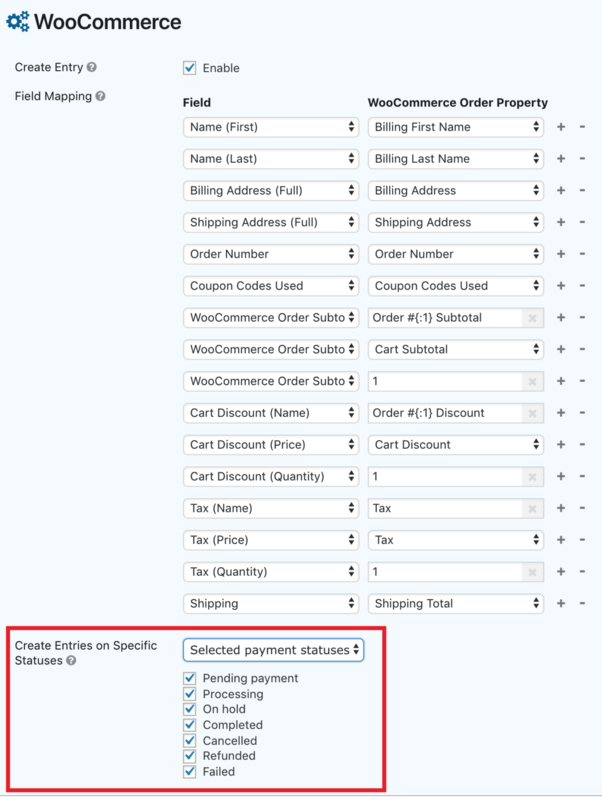 Added WooCommerce payment statuses to feed conditions and field filters. Added support for the WooCommerce Gravity Forms Products Add-ons Extension. Updated the cancel and refund payment steps. It’s now possible to cancel a pending order. 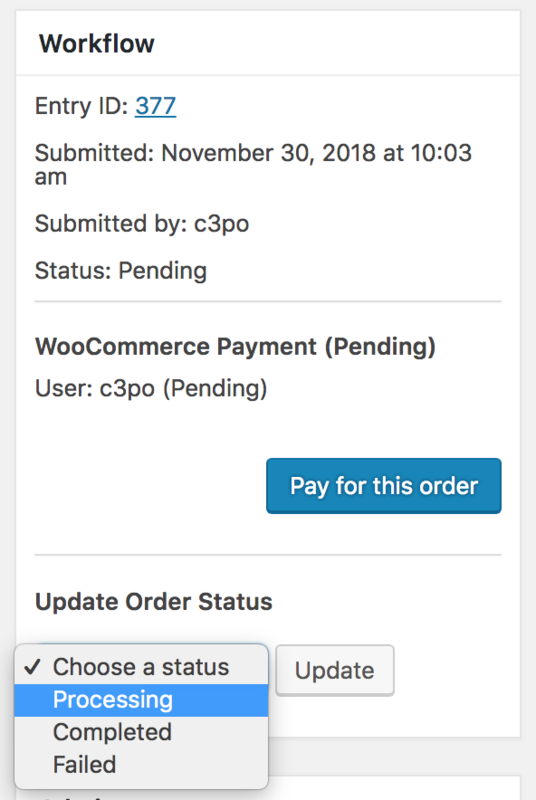 Updated the payment step so it can wait for a WooCommerce order to be created. Fixed the PHP fatal error when WC()->session isn’t set.